American botanist and horticulturist John Bartram, born in Darby, Pennsylvania, purchased a farm in Kingsessing on the western bank of the Schuylkill River in 1728. He developed a botanical garden on the site that same year. Originally intended for his personal enjoyment and continued botanical research, the garden attracted a wider audience as it expanded to include newly discovered species. In the late eighteenth century and into the mid-nineteenth century, Bartram’s Garden served as one of the premier international trading points for plants native to North America. Through the work of volunteers, Bartram’s Garden was preserved through the latter half of the nineteenth century, until it was purchased by the city in 1891. Today, Bartram’s Garden is open to the public and contains some of the oldest trees in Philadelphia. A ginkgo tree, a male sent to the United States in 1785, is believed to be the oldest representative of the species in America. The origins of Fairmount Park are rooted in the 1793 yellow fever epidemic. The Fairmount Waterworks, center on the river in this illustration, replaced the hastily built waterworks at Center Square in 1815. The park expanded during the nineteenth century, in part to protect the city water supply from contamination, and the first formal public garden there was designed in 1829. 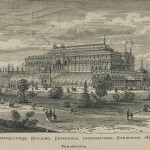 Many of the park’s formal elements date to the 1876 Centennial International Exhibition. 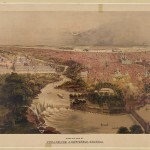 Fairmount Park’s 285 acres served as the grounds for the exhibition, shown to the left of this illustration. Five large halls were constructed in the park to serve the ten million guests the Centennial Exhibition attracted. Of these, two survived into the twentieth century, Memorial Hall and Horticultural Hall. Horticultural Hall and its surrounding formal gardens fell into disrepair and were demolished in 1955. Memorial Hall, designed to house the Centennial’s art exhibitions, continues to stand and, in 2008, became home to the Please Touch Museum. Other projects spurred by the Centennial include the Garden of the Zoological Society of Philadelphia, now known as the Philadelphia Zoo, which opened in 1874 as a botanical garden with a menagerie. It is the oldest zoological park in America. Some of the buildings constructed for the 1876 Centennial celebration were designed to be permanent public attractions. Among these was Horticultural Hall, a Moorish glass greenhouse that housed a collection of exotic plants. The building was surrounded by elaborate formal gardens. After the Centennial ended, the grounds were maintained and the botanical gardens within Horticultural Hall continued to be open to the public. During the Great Depression and World War II, it gradually fell into disrepair and the gardens surrounding it were abandoned and removed. Hurricane Hazel did further structural damage to the building in 1954 and it was finally demolished in 1955. Horticultural Hall was replaced by the new Horticulture Center for the 1976 Bicentennial Celebration. 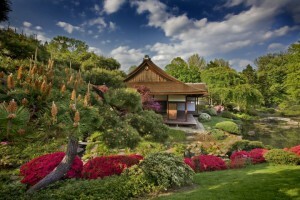 The new pavilion includes a greenhouse, arboretum, and the Shofuso Japanese House and Garden. 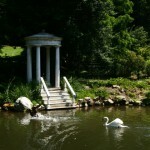 Many of Philadelphia's public gardens began their lives as private estates, as was the case for the Morris Arboretum. The 92-acre park in Chestnut Hill was originally the summer estate of John T. Morris, a Philadelphia businessman and decorative art collector, and his sister Lydia. 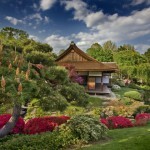 They purchased the land, dubbed "Compton," in 1887 and began to landscape the grounds with plants from around the world. After retiring from his family's business in 1891, the estate and its gardens became Morris's primary interest. He became interested in public spaces later and funded the construction of the Japanese gardens in Fairmount Park to complement the new Nio-mon Japanese Temple Gate acquired by the city. Located within the Horticulture Center, the Shofuso Japanese House and Garden has become one Fairmount Park's feature attractions. The grounds on which it stands once housed the Nio-mon Japanese Temple Gate, which the city of Philadelphia acquired in 1908 from the 1904 Louisiana Purchase Exposition. 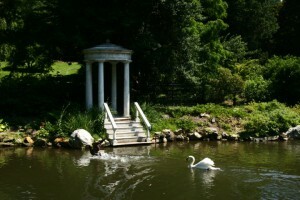 The gardens surrounding it were funded in 1909 by businessman and art collector John T. Morris, whose own estate later became the Morris Arboretum. In 1955, the original temple gate, which dated to the 1600s, succumbed to a fire. Longwood Gardens in Kennett Square was established in 1798 when brothers Samuel and Joshua Pierce began converting their family's farmland into an arboretum. 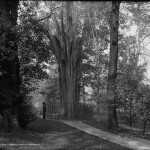 It was dubbed Pierce's Park and became a popular gathering spot for local families, growing through the years until it became one of the largest collections of tree specimens of the nineteenth century. By the dawn of the twentieth century, however, the Pierce family was no longer interested in operating the park and began negotiations to sell the collection for lumber. In 1906, the arboretum was saved from destruction by Delaware-based industrialist Pierre du Pont, who purchased it as a private estate. During his residence on the property, du Pont added many of the garden's most notable features including its system of fountains and the first conservatory buildings. He welcomed visits from the public. On his death in 1954, he willed the land and most of his fortune to the Longwood Foundation for the continued preservation of his gardens. Nearly one million people visit Longwood Gardens annually. In recent years, the gardens have been expanded and renovated, including the addition of forty-six acres to the meadow of native wildflowers. More than three centuries of private and public efforts have given the Philadelphia area the highest concentration of public gardens in the United States. Although William Penn (1644-1718) originally envisioned five squares dotting his metropolis, the energies of private citizens initially cultivated the plants, gardens, and landscapes of Philadelphia. From these beginnings, public gardens became larger, more numerous, and varied, establishing the region as a place of importance in American horticultural history. The notion of a designed, urban public garden did not exist when Penn founded Philadelphia in the seventeenth century. His vision for a “greene country towne” held no provision for public parks or gardens. Instead, this characterization referred to the private use of land within the original city. Penn envisioned a system of large lots of a minimum of half an acre, with the house placed “in the middle of its platt, . . . so there may be ground on each side for Gardens or Orchards, or fields.” In this way, he sought to make his town green. Penn set aside public land in the form of Philadelphia’s five squares, but, with the exception of the Central Square, they were not to be used as gardens but rather “as the Moor-fields in London.” While “walks” traversed them, London’s Moorfields primarily served as a multipurpose landscape where, for example, plague victims were buried and rival guilds met in battle. Similar uses predominated in Philadelphia’s squares before they became sites of city gardens beginning in the late eighteenth century. Militia drilled there; the squares later named Washington and Franklin held burial grounds; and Washington Square hosted a livestock auction. Clay was mined from the square later named Rittenhouse, and the square later named Logan was the site of public executions. Trash was dumped in them all. One of the best known of these early public gardens was at Gray’s Inn on the west side of the Schuylkill River near the point later crossed by Gray’s Ferry Avenue. Visitors to Gray’s Gardens, located on the main route south out of the city, wrote rapturously of their experiences there before and during the period of the American Revolution. They enjoyed musical entertainment and food and toured the extensive greenhouse, a series of summerhouses and other garden structures, and meandering walks. In the early nineteenth century, merchant Henry Pratt’s (1761-1838) Lemon Hill estate northwest of Philadelphia overlooking the Schuylkill River likewise opened its doors to the ticketed public. After Pratt’s death, the estate hosted public Sangerfests (German celebrations) until bought by the city in 1855 for Fairmount Park. The development of the first truly public garden within the city began in 1784, when Englishman Samuel Vaughan (1720-1802) began a campaign to transform the State House Yard (later Independence Square). A close associate of Benjamin Franklin, Vaughan was an enthusiastic supporter of the young republic and its new cultural institutions and organizations, particularly the American Philosophical Society. It is no accident that the creation of the permanent home for the Philosophical Society in the State House Yard coincided with Vaughan’s work to make a garden there. One of Vaughan’s goals was to plant a collection of American trees, an ambition echoed in other early gardens. In a landscape featuring serpentine gravel walks and artificial mounds, with Windsor chairs and benches provided for visitors, the State House Garden’s plantings included one hundred American elms. The site became a political emblem of the advancement of the young American civilization. The State House Garden set an important precedent for reviving Penn’s original squares as the city’s development moved west from the Delaware River in the pre-Civil War period. A public garden in Center Square surrounded Benjamin Henry Latrobe’s pumping house for the short-lived Chestnut Street Waterworks. Southeast (later Washington) Square followed in the 1810s and became the centerpiece of an elite neighborhood, much as Southwest (Rittenhouse) Square did after mid-century. 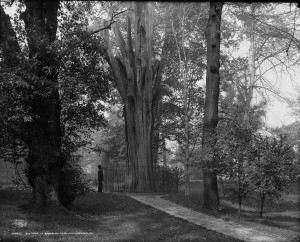 The garden in Franklin Square, established in the 1830s, featured a fountain supplied by the new Fairmount Water Works; the contemporary press marveled at the technological ingenuity of it. Many of these reinventions of Penn’s squares were the product of efforts from the Pennsylvania Horticultural Society, founded in 1827. In 1829, the society hosted the first Philadelphia Flower Show in Masonic Hall on Chestnut Street, where twenty-five of Philadelphia’s elite gardeners showed their finest specimens. 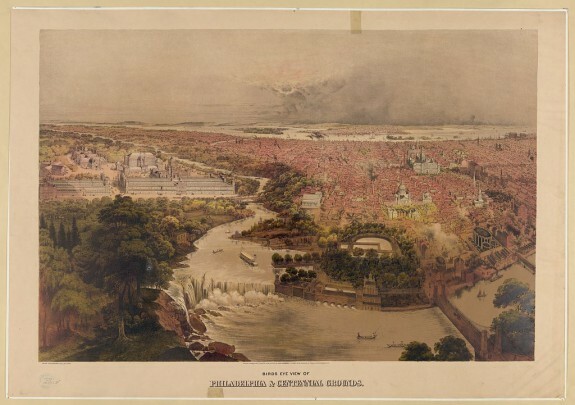 The horticultural transformation of Fairmount Park in anticipation of the 1876 Centennial celebration of American independence ushered in a new generation of public landscapes. The Garden of the Zoological Society of Philadelphia opened to the public on July 1, 1874. Although it became known simply as the Philadelphia Zoo, it was originally conceptualized as a botanic garden hosting a zoological collection. 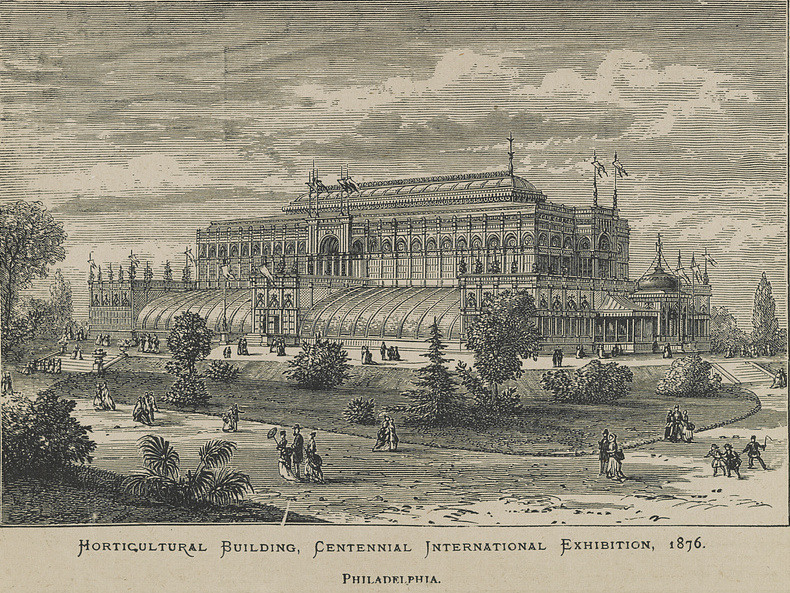 Two years later, the Centennial Exhibition also promoted Philadelphia’s gardening skills. More than 20,000 trees, shrubs, and decorative hedges were planted over the exhibition’s 285 acres in Fairmount Park. The Colonial Revival that the Centennial helped to popularize led to a return to orthogonal geometry in “formal” gardens, not only in Fairmont Park of Philadelphia, but across the nation. Horticultural Hall, a huge glass and iron structure and one of the two permanent buildings constructed for the Centennial, housed exotic and rare botanical specimens from around the world as well as indigenous American plants. 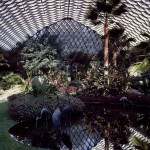 It continued to serve as a conservatory until Hurricane Hazel ravaged it in 1954; the city razed the building the following year. 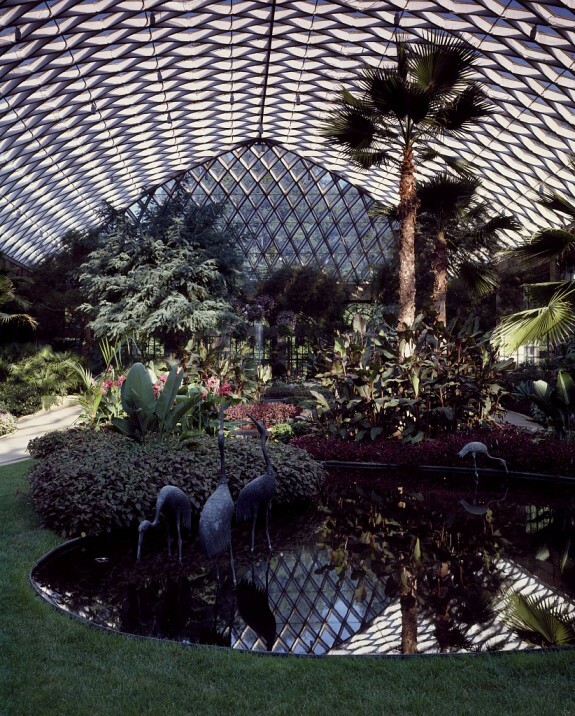 For the 1976 Bicentennial, the city built a new Fairmount Park Horticulture Center on the site, complete with indoor greenhouses and outdoor perennial, annual, vegetable, and demonstration gardens. 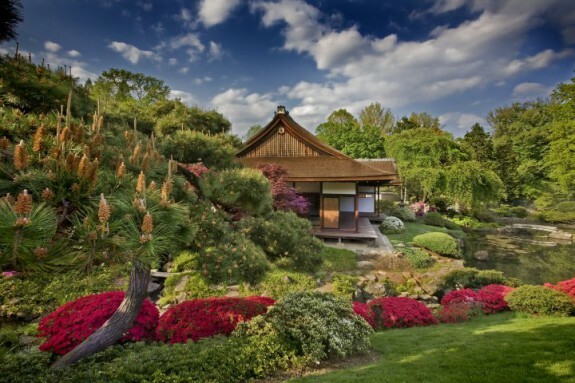 Another legacy of the Centennial was one of the first large-scale Japanese gardens in the United States, a teahouse and garden exhibit created by the Japanese government in West Fairmount Park. After the Centennial, these features remained, later joined by the Nio-mon Temple Gate, which was moved from the 1904 Louisiana Purchase Exposition in St. Louis. After the gate burned down in 1955, it was replaced three years later by Pine Breeze Villa, or Shofuso, a gift from Japan to the United States. From its roots at the Centennial, this garden influenced American taste. It helped start a vogue for Japanese gardens in landed American estates and inspired appreciation for foreign gardening styles. Beginning in the late nineteenth century, Philadelphians revived or invented gardens as numerous colonial-era estates became public historic sites. In 1888, the City of Philadelphia purchased Bartram’s Garden, which had remained in private hands till that time. The garden, the oldest surviving botanic garden in the United States, still holds a number of historic trees planted by the Bartrams, including the oldest ginkgo tree in the nation. Other historic estate gardens became public under the auspices of the Commonwealth of Pennsylvania. For example, in 1957 the state acquired the Highlands Mansion and Gardens in Fort Washington, a late eighteenth-century Georgian mansion with two acres of grounds. The trend of turning estate gardens into public sites continued throughout the Philadelphia region over the twentieth century. In Philadelphia, the University of Pennsylvania purchased the Morris family’s Compton Estate in Chestnut Hill and then reopened it as the Morris Arboretum. In southeastern Pennsylvania and Delaware, a group of DuPont family estates also opened for visitors, notably Longwood Gardens in Chester County, which opened to the public after the death of Pierre S. DuPont (1870-1954), and sixty acres of naturalistic gardens at the nearby Winterthur Museum in Delaware. Other historic DuPont estates nearby include the Mt. 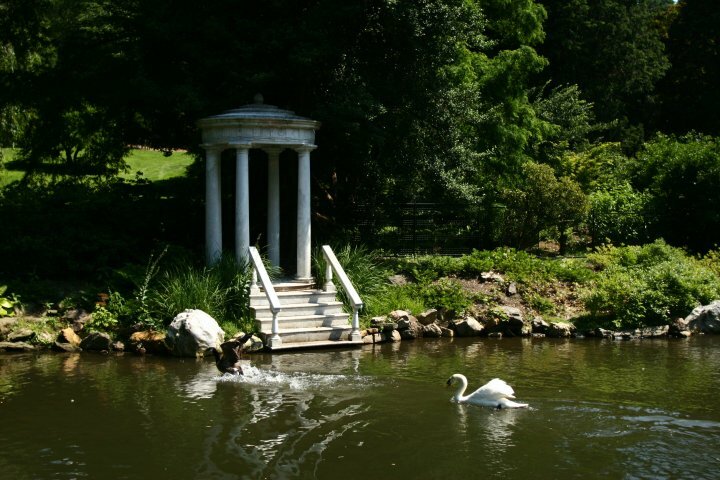 Cuba Center, a preserve of the indigenous flora of the Appalachian piedmont; Nemours Mansion & Gardens, famed for its formal French gardens; and the Hagley Museum and Library, with original mansion gardens along the Brandywine River. Anastasia Day is a doctoral student and Hagley Fellow in the History Department of the University of Delaware. She studies environment, technology, and food, primarily in the American twentieth century. Her dissertation is on Victory Gardens in World War II. Emily T. Cooperman is an architectural and landscape historian and historic preservation consultant. She serves as the principal of ARCH Preservation Consulting and as a senior consultant for Preservation Design Partnership. Her published work includes, with Lea Carson Sherk, William Birch: Picturing the American Scene (Philadelphia: University of Pennsylvania Press, 2010). Abbot, Elizabeth O. Bartram’s Garden, Philadelphia, Pa. Philadelphia: The John Bartram Association, 1915. Milroy, Elizabeth. “‘For the like Uses, as the Moore-Fields’: The Politics of Penn’s Squares.” Pennsylvania Magazine of History and Biography Vo. 130, No. 3 (July 2006): 257-82. Fairmont Park Commission Archives, 1515 Arch Street, Philadelphia. Pennsylvania Horticultural Society Records, McLean Library and Archives, Pennsylvania Horticultural Society, 100 N. Twentieth Street, Philadelphia. Barnes Foundation Horticulture Library, Barnes Merion Campus, 300 N. Latch’s Lane, Merion, Pa. Historic Strawberry Mansion, 2450 Strawberry Mansion Drive, Philadelphia. Horticulture Center, 100 N. Horticultural Drive, Philadelphia. Shofuso, Lansdowne and Horticultural Drives, West Fairmount Park, Philadelphia. Historic Germantown, 5501 Germantown Avenue, Philadelphia. Hagley Museum and Library, 601 Foundation Drive, Wilmington, Del. Morris Arboretum, 100 E. Northwestern Avenue, Philadelphia. Mt. Cuba Center, 3120 Barley Mill Road, Hockessin, Del. Nemours Mansion and Gardens, 850 Alapocas Drive, Wilmington, Del. Philadelphia Zoo, 3400 W. Girard Avenue, Philadelphia. Winterthur Museum, Garden, and Library, 5105 Kennett Pike, Winterthur, Del.